This Holiday season has gone by way too fast for me. I definitely haven’t had my share of eggnog, carols, or candy canes yet. If you’re like me and still have lots to do…let’s hurry! Here are a few quick last minute candy cane treats that make quick homemade gifts, too. 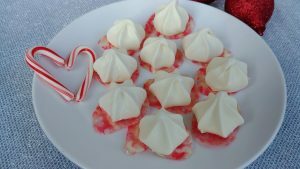 Candy Cane Meringue Coffee Toppers: Drop crushed candy canes by teaspoons onto parchment lined baking sheet. Bake at 350* for 4 minutes or until melted. 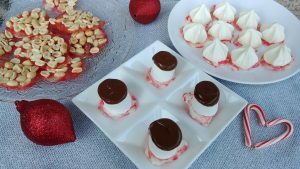 Quickly top with store bought meringues. 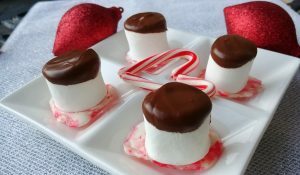 Chocolate Candy Cane Marshmallow Hot Cocoa Toppers: Drop crushed candy canes by teaspoons onto parchment lined baking sheet. Bake 4 minutes or until melted. Quickly top with marshmallows, giving a little twist to set. Let cool. Dip tops into melted chocolate. Let set. 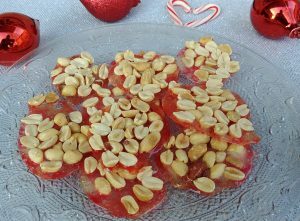 Peppermint Peanut Brittle: Drop crushed candy canes by tablespoons onto parchment lined baking sheet. Bake at 350* for 4 minutes. Quickly top each with tablespoon of unsalted peanuts. Return to oven for 3 minutes. Let cool. Store in airtight container. 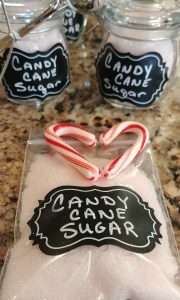 Candy Cane Sugar: Microwave 1 crushed mini candy cane with 1 teaspoon warm water for 30 seconds. Stir until melted. Let cool. Whisk into 1/4 cup granulated sugar until fully absorbed. Let air dry in a single layer on parchment paper for at least two hours. Pulse in mini processor until fine. Double recipe as needed. Store in airtight containers. Perfect for baking, coffee, or a peppermint twist French 75 champagne cocktail! I hope everyone has a beautiful Holiday season spent with friends and family and a very happy and healthy New Year! As always, if you have any questions as to what to do with any leftovers, just ask! Wow so many treats to choose! Sweet recipes. 😋 Yummy! Definitely makes a Christmas merry.